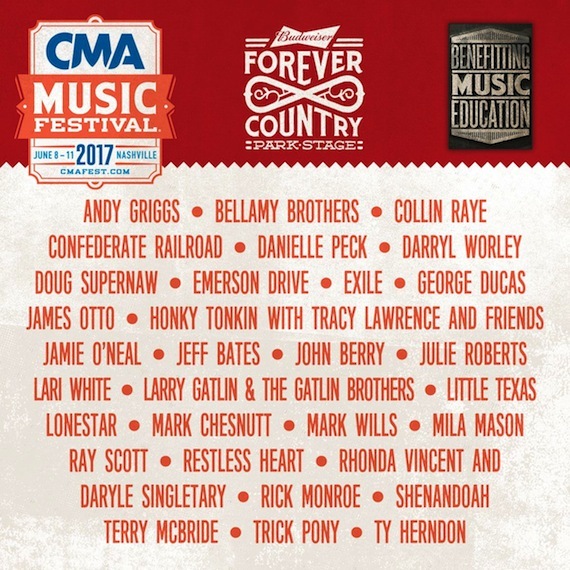 Fans of old school country will be happy to know that the CMA Music Festival has added a new “Forever Country” stage in the park space behind Ascend Amphitheater during Music Fest week. The new stage will feature performances by country acts from the 80’s, 90’s, and 00’s including Jeff Bates, Bellamy Brothers, John Berry, Mark Chesnutt, Confederate Railroad, George Ducas, Emerson Drive, Exile, Andy Griggs, Ty Herndon, “Honky Tonkin’ with Tracy Lawrence and Friends”, Larry Gatlin & the Gatlin Brothers, Little Texas, Lonestar, Mila Mason, Terry McBride, Rick Monroe, Jamie O’Neal, James Otto, Danielle Peck, Trick Pony, Collin Raye, Restless Heart, Julie Roberts, Ray Scott, Shenandoah, Doug Supernaw, Rhonda Vincent and Daryle Singletary, Lari White, Mark Wills, and Darryl Worley. Additionally, the the Music City Stage returns for a second year, located in the Nashville Visitor Center at Bridgestone Arena. Nashville Convention and Visitor Corp’s Music City Stage is the only free, air-conditioned, indoor festival stage, offering fans a convenient place to escape the heat while still catching entertainment from some of country’s newest rising stars. Appearing on the Music City Stage Thursday through Sunday are Jimmie Allen, Sammy Arriaga, Kassi Ashton, Maggie Baugh, Brennley Brown, Brian Callihan, Dallas Caroline, Jessie Chris, Julia Cole, Nora Collins, Dalton & the Sheriffs, Shelly Fairchild, Kenny Foster, Livy Jeanne, Jessie Key, Colm Kirwan, McCoy, Tristan McIntosh, Megan & Liz, Native Run, Camille Rae, Mary Sarah, Zach Seabaugh, CJ Solar, Scott Stevens, Sweet Tea Trio, Mitchell Tenpenny, The Hootz, Kasey Tyndall, and James Robert Webb. On Sunday ASCAP Presents at the Music City Stage will showcase artists Raquel Cole, Crooked King, Dorado, Adam Hambrick, Lucas Hoge, Martin McDaniel, Post Monroe, Brandon Ratcliff, Sarah Allison Turner, and Anna Vaus. “We focus on programming unforgettable performances on every stage and thank our returning partners for helping us to do that, while also offering unique activities and experiences for fans,” said CMA Chief Executive Officer Sarah Trahern.